Correct lighting is as important as any part of interior design in your home, but is far too often overlooked when furnishing the home. Light adds character to your rooms and can convey the mood. The right lighting will make your house feel like home. Let’s have a look at the different lighting styles that will help to stamp your mark in your own four walls. Even though the majority of the time spent in your bedroom is with your eyes closed, lighting is still an important factor. It is important to create a nice relaxing and cosy atmosphere in the bedroom since it is, primarily, a place of rest and sometimes intimacy. Bedside lamps can really help to accentuate the feeling of cosiness. They often give a dimmer and darker light than the main light, which helps to create the feeling of warmth and well-being that everyone wants in the bedroom. It is important to have a main light in the bedroom to provide a fine centrepiece.Be careful to choose the right type here. A ceiling light that is too bright and white can give the whole room an unnatural feeling. Try to go for a more natural looking light for your bedroom ceiling. Living room lighting is all about the extravagant centrepiece! For most people this is a chandelier. 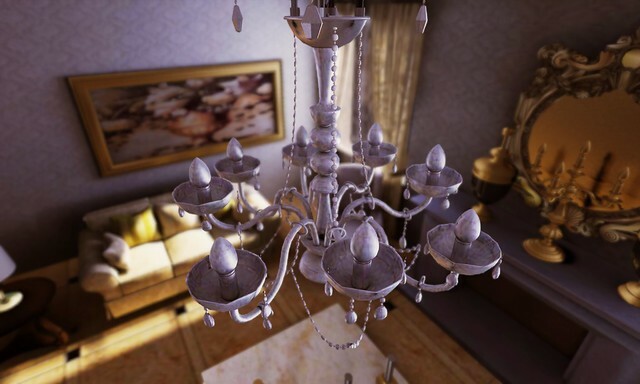 Even if you tend to not use your ceiling light in the living room and prefer to use the lamps that dotthe room,a chandelier can make for a lovely centrepiece. As many people spend much of their time in the living room, the atmosphere you want to create there is crucial. Different tones of light can be pivotal in creating the right ambience for a room. Next to the type and placement of lighting, installing a dimming feature can help.These are particularly well utilised with wall lights that can provide soft, low level lighting. In the kitchen, it is important to light the areas in which you are likely to perform most stages of food preparation. With this in mind, it is a great idea to install task lighting underneath overhead cupboards. This can help to stop your shadow blocking the areas, in which you perform tasks and is well hiddento not intrude on the kitchen environment. 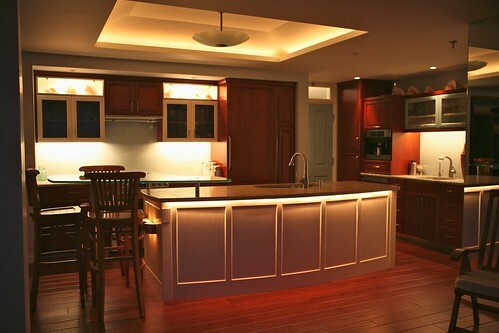 To add a nice modern touch to the kitchen, why not try and install lighting inside your see-through cabinets. This can make a kitchen look very modern and can act as a wall light. If using this technique, however, be sure that you don’t mind people seeing what is in your cupboards! The dining room is one of the most important rooms in the house. It is often used as a communal place for the family and is one of the first stops when entertaining guests. A good lighting scheme in the dining room can make it more welcoming and comforting to guests, family and regular visitors. For more formal dining areas, chandeliers have been very popular. A nice chandelier above the table creates a great flair for your dinner parties. However, for the more modern and relaxed dining area, a more contemporary approach is often favoured. Some modern ideas can be halogen or LED downlights, which offer great spotlight style lighting. Others involve low hanging individual lights, which create a feeling of cosiness. These are the basics of creating a lighting scheme for your home. For further inspiration why not take a look at this great online lighting guide.